Easy and delicious mint chocolate chip cookies; these cookies are bursting with flavor and so simple to make! After you’ve gotten your mint chocolate chip cookies fill, you’ve got to try these famous snickerdoodle cookies, these oatmeal chocolate chip cookies, or soft and chewy peanut butter cookies! Are you all cranking out cookies right and left for the holidays? I know I am! Between testing cookie recipes to share with you all and making treats for neighbors/friends, it feels like cookies have been coming out of the oven nonstop! 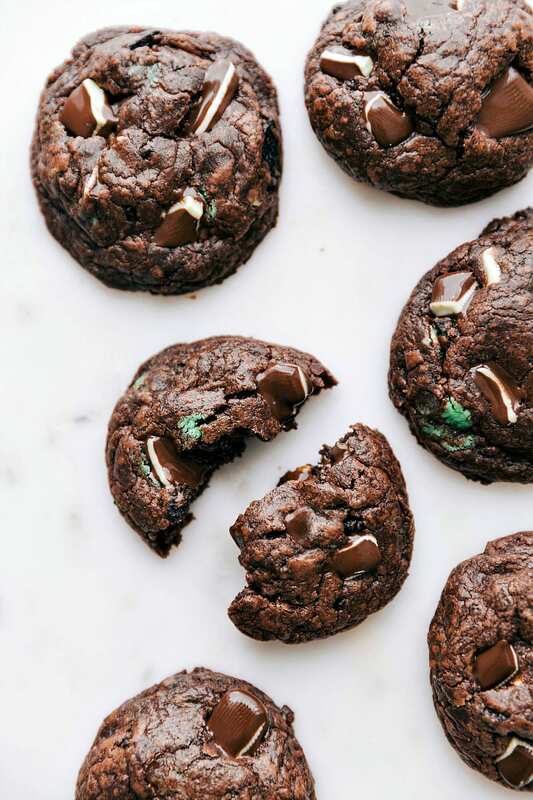 And these mint chocolate chip cookies are a complete holiday lifesaver. These mint chocolate chip cookies require no chilling, take about 10 minutes flat to make, and only have EIGHT ingredients. How Do You Make Mint Chocolate Chip Cookies? 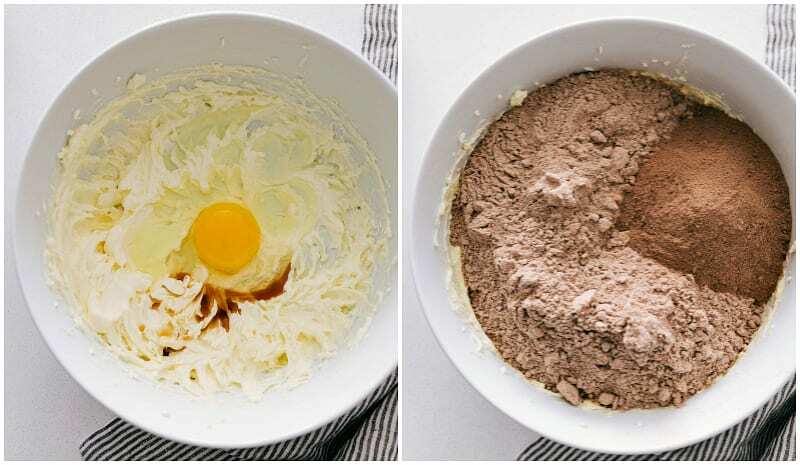 Start by beating together butter and cream cheese. You’ll want to make sure both ingredients are at room temperature (not cold, not melted). Egg and vanilla get beat in next! Finally: stir in your add-ins. 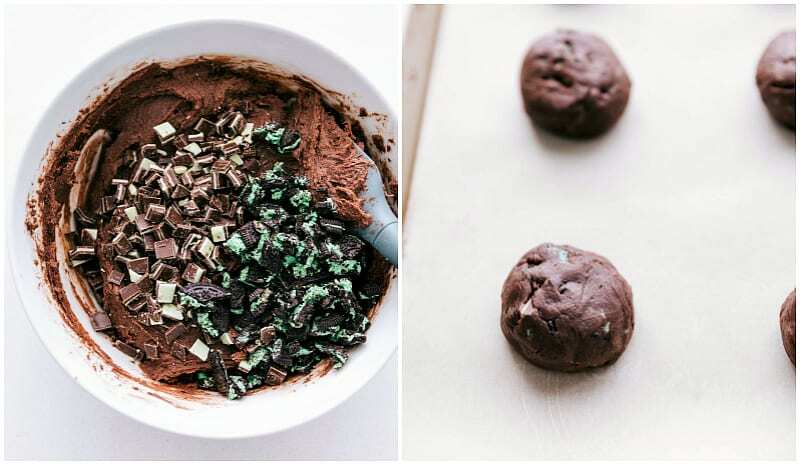 For these mint chocolate chip cookies we’re adding in chopped andes mints AND mint chocolate oreos. If you only want to do one add-in; double either of the add-ins and omit the other one! Use room temperature ingredients: Melted butter or cream cheese will make these cookies too wet/greasy. To get either to room temperature quickly, check out this article! 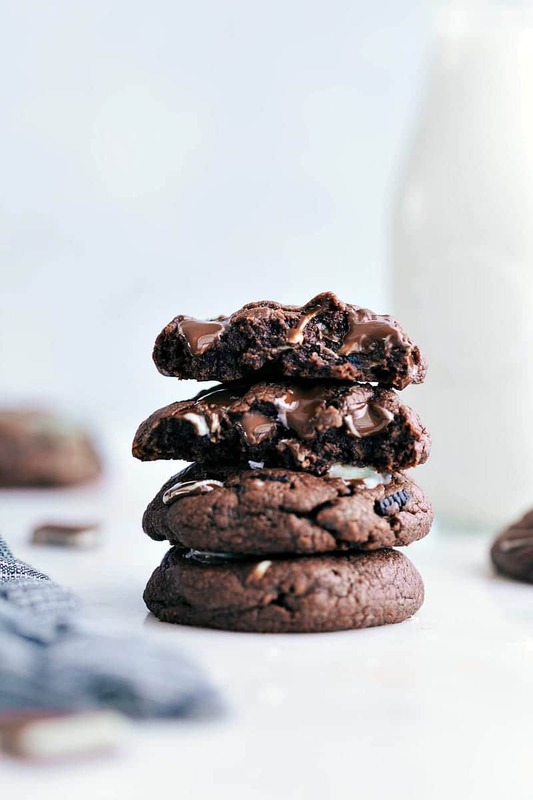 Check the ounces: make sure to check the ounces on the brownie mix and pudding mix to ensure you’ve got the right size — too large of a brownie mix and you could end up with dry, crumbly cookies. Preheat the oven to 350 degrees F. Prepare a sheet pan by lining with parchment paper or a silpat liner. 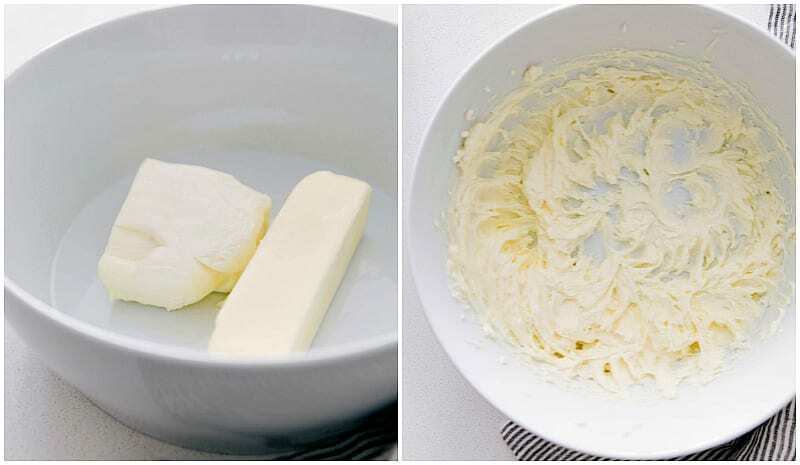 In a large bowl (stand mixer recommended, hand mixers will work), cream together the cream cheese and butter. Both should be slightly soft, but not melted. Add in the egg and vanilla extract. Beat. Beat in the brownie mix and pudding mix until just combined. Gently fold in the coarsely chopped mint oreos and coarsely chopped Andes mints. (The dough is thick and sticky! IF it's too hard to work with, cover and place in the fridge for 10 minutes then continue). Form large balls of dough and then slightly flatten. Bake for 8-12 minutes and then remove from the oven. (Baking time may vary based on the size of your cookies and actual oven temperature) It's best to slightly under-bake these cookies to keep them soft, fudgy, and chewy! If desired, top the cookies with a few more Andes mints (just to make them look pretty!). Allow to continue to "bake" on the cookie sheet for an additionally 3-4 minutes before removing them to a cooling rack. *If you aren't a fan of Oreos or don't want them in your cookies, you can leave these out entirely or add an extra 1/2 cup chopped Andes mints in its place! I haven’t started my baking yet, so these are going on my list!!! Yes, I have been making cookies like crazy and now I don’t know what to do with them! But these….these look too easy NOT to make. I have been seeing these delightfulls everywhere and wondering how they tasted. AND NOW, I know that they are totally amazing. I’m all for a cookie and a brownie IN ONE. Pinned! These cookies look amazing, Chelsea! 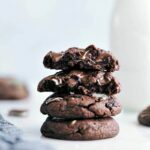 Brownie cookies are one of my favorites, so soft and fluffy! And I’m loving the mint and oreo combination. What a perfect cookie! Pinned! Ooooh love it! Brownie cookies are my favorite. Mainly because they’re part brownie. And yes, it’s cookie SEASON in my kitchen right now!! Can’t stop won’t stop. I love how festive these brownie cookies are! Love Oreos! Pinned of course! Gah! I haven’t been getting any of your posts in my BL feed and then they all popped up at once. I’m hoping that nonsense has sorted itself out because I need your deliciousness in my life. And I need these cookies, too. Two batches. Pinned! Love how fudgy these look! Perfect for holiday gatherings! Yay, you’re back on my bloglovin (I just deleted and reloaded you lol). 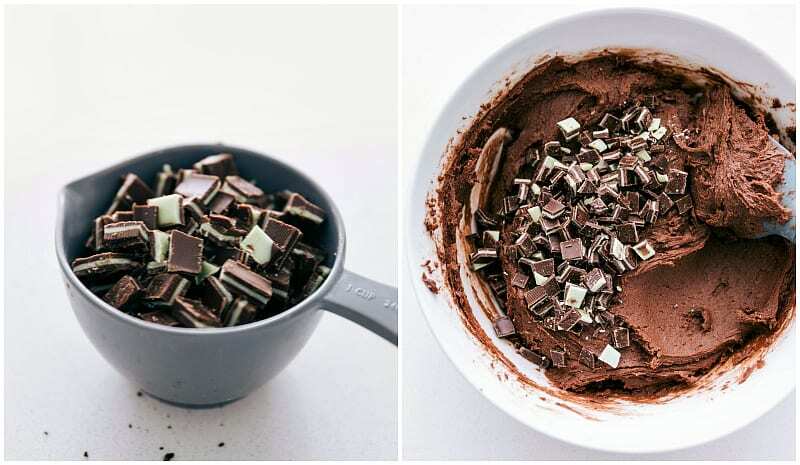 This looks INSANE and I’ve been craving the chocolate and mint combination lately, after swearing it off- and the texture! Pinning! Oh.yum. I’m already in love with these cookies! They look irresistibly delicious and I love how simple they are to make! 🙂 Can’t wait to try! Pinned! This stuffed cookies look delicious Chelsea! I’m definitely cranking out the Christmas cookies this season! Chelsea, love these cookies!! No chill and only take about 10 minutes to make? love!! I’m these days I’m all about convenient and easy so I love the use of the brownie mix!! what a great idea! These look fudgy and amazing! I really must try them! -FULL of delicious things! Oreo’s! Delightfulls! etc. I’ve completely run out of time, calories & counter space for all of the cookies I’ve already made and still have yet to bake! It’s as if I have a cookie tree sprouting its “fruit” in the middle of my kitchen. Oh well, there are worse things in life… Especially if it produced decadent cookies as chocolaty as these! 😉 Pinned! I made these and loved them, however, 9 minutes baking was too long. They were done in 8 minutes, and overcooked at 9. The shorter time made them delicious. I also rebut teared the pan each time, and quickly removed them from the pan after they were done, so they didn’t stick. My family loved them! Thank you so much for your comment Becky! I appreciate you trying out this recipe and sharing your feedback 🙂 Glad the family loved them!